The Ancient Egyptians believed in One God who was self-produced, self-existent, immortal, invisible, eternal, omniscient, almighty, etc. This One God was never represented. It is the functions and attributes of his domain that were represented. These attributes were called the neteru (pronounced net-er-u, singular: neter in the masculine form and netert in the feminine form). The term, gods, is a misrepresentation of the Egyptian term, neteru. When we ask, “Who is God?”, we are really asking, “What is God?”. The mere name or noun does not tell us anything. One can only define God through the multitude of his attributes / qualities / powers / actions. This is the only logical way, because if we refer to, say, a person as Mr. X, it means nothing to us. However, once we describe his attributes and qualities, we then begin to know him. A person who is an engineer, a father, a husband, … etc. does not have poly-personalities, but rather a mono-personality with multiple functions/attributes. For the Ancient and Baladi Egyptians, the concept of God is similar. To know “God” is to know the numerous qualities of “God”. The more we learn of these qualities (known as neteru), the closer we are getting to our divine origin. Far from being a primitive, polytheistic form, this is the highest expression of monotheistic mysticism. In Ancient Egyptian traditions, Ra represents the primeval, cosmic, creative force. The Litany describes Ra as The One Joined Together, Who Comes Out of His Own Members. The Ancient Egyptian definition of Ra is the perfect representation of the Unity that comprises the putting together of the many diverse entities, i.e. The One Who is the All. The Litany of Ra describes the aspects of the creative principle: being recognized as the neteru (gods) whose actions and interactions in turn created the universe. As such, all the Egyptian neteru who took part in the creation process are aspects of Ra. There are 75 forms or aspects of Ra. I have multitude of names, and multitude of forms. 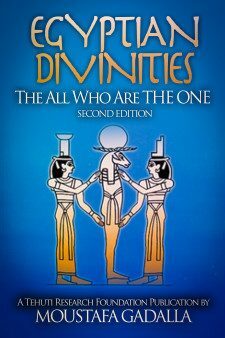 Egyptian Divinities: The All Who Are THE ONE, 2nd ed.